The Taylor Twelve are sons of a preacher but far from saints. Matter of fact, they are nothing but trouble. Thomas Taylor is a single father of six boys, accused of his late second-wife’s murder. He doesn’t really remember what happened that night, because he’d drank too much. But he does know he never should have married the no-good woman hoping for a mother for his children after his first wife died, leaving him to raise them on his own. Angel Dimitri is a social worker, come to vacation on Thunder Lake and also to make an unofficial visit to a man who the townsfolk say is an unfit father. Angel sees the rustic way in which Thomas lives and raises his children, but also sees a man who would never abuse a child but torture himself instead. When he is about to lose his children and she feels it is her fault, she steps in to do something so crazy that she starts doubting herself instead of Doubting Thomas. Angel watched in horror from the tree house as Thomas Taylor risked his life to save her. The dogs were barking and growling, hair standing up on their backs. If she wasn’t mistaken, foam dripped from their mouths. The things could be rabid, yet Thomas stood there, weaponless, not even picking up a stick or a stone to defend himself. The dogs encircled him, but he didn’t move. He didn’t take his eyes off them for a second. She wanted to call out to him, but didn’t. If she was to distract him now, it could be deadly. Instead, she closed her eyes and prayed. The animals went suddenly silent. She opened her eyes and looked past the branches of the tree. They were gone. So was Thomas. She looked out over the far edge of the tree house, and when she’d turned back he was standing next to her, his large body slightly bent under the low roof. Angel’s heart pumped furiously inside her chest. She shouldn’t show fear toward him either. She struggled to regain her breath to answer. He looked at her through squinted perusing dark eyes, and she suddenly felt cramped in the small tree house cabin. His large body filled most of it. His presence was powerful and domineering. “Hunting season for dogs isn’t until next month.” He sounded so serious that for a moment she almost believed him. “Wouldn’t we all?” he mumbled, and she had a feeling his words weren’t talking about their meeting, but another part of his life. He didn’t say anything, so she continued. He’d gone to extremes to correct her, but never even acknowledged her apology. Before she could continue, he was heading down the wooden ladder nailed to the tree. She scrambled after him. “No, really, I insist.” In her hurry, her foot slipped on a rung. He was there to steady her and help her to the ground. His hands lingered on her waist. Or was it only her imagination? Her eyes traveled up his arms and settled on the Celtic cross on a chain around his neck. She hadn’t even noticed it before. Her eyes met his, and in their dark depths she could see hope, fear, determination and care. Also, something else she couldn’t quite decipher. She studied his face for a second, and noticed he was doing the same to her. His features were hard, his mouth set firm. His nose was straight, his brows thick. Thick stubble shaped his lower face, and his dark hair was unkempt, shooting out in several directions, and falling nearly to the neckline of his white tee-shirt. And to her surprise, he had a small gold hoop earring hanging from one ear. He was rugged, but handsome. He emitted a sense of danger and pride, yet a hint of gentle sadness reflected within his eyes. His hands were large, his arms muscled and sturdy. She was sure he did some sort of manual labor, and quite often, to be so physically fit. A small rush of heat from his hands on her waist traveled all the way to her face. Something flashed in those dark eyes of his, and for a moment, she’d almost thought he’d felt the same attraction she’d felt. Then, he removed his hands from her waist, and stuck them in the front pockets of his jeans. That soft caring look she’d glimpsed in his eyes was gone, and the hard, cool edge returned. I would love to read this Thomas Tyler is an interesting character! Thanks Judy. 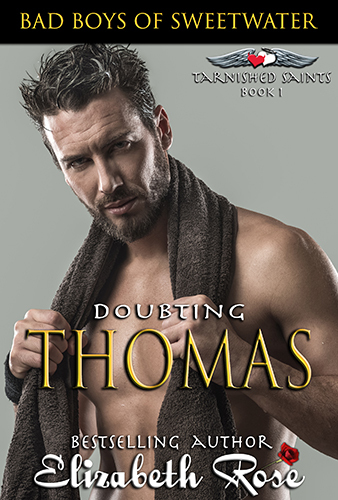 You can get a copy of Doubting Thomas from now til Valentine’s day for only 99 cents. And the prequel is free. Loved Thomas, he went through so much but not till Angel came into his life did he finally face his fears. I think he had to find love to face them and look for answers.